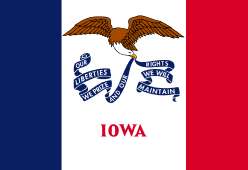 This is Iowa's Flag Day, the day on which the Iowa General Assembly officially approved a state flag back in 1921. There was no state flag for the first 75 years that Iowa was a state. In World War I, Iowa's chapter of the Daughters of the American Revolution set up a contest to design a flag that Iowans could carry into battle. The winner was Dixie Cornell Gebhardt of Knoxville, and that Iowa regimental flag was adopted as Iowa's state flag a few years after the war. Some have noticed a good deal of resemblance between the Iowa flag and that of the country of France. That's no accident. The land that is now Iowa was part of the Louisiana Purchase in 1803, when the U.S. bought the land from France. Dixie Gebhardt wrote that "Iowa's banner should embrace the history of its domain from the time of its occupation by the Indians to discovery by the French and purchase from Napoleon by Jefferson, to its admission into the Union, down to the present time. 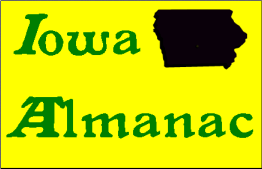 All this should be represented in a design so simple that school children and adults can recognize its symbolism and know that it meant Iowa." That includes blue, white and red stripes, with an eagle displayed on the white center stripe. The eagle carries in its beak blue streamers with the state motto, "Our Liberties We Prize and Our Rights We Will Maintain". The word "Iowa" is in red, the color of blood. Mrs. Gebhardt said she used that to symbolize the wartime "sacrifice our boys may make for us." That original flag design was drawn in crayon. You can see it today, on display in the Marion County courthouse in Knoxville. Iowa's flag has flown proudly now for nearly 100 years, ever since it was approved by the state legislature, on this date in 1921. "There is no limit to electricity's power to serve you, and the more you use of it, the less it costs." Or so read an ad in the Hampton Chronicle newspaper in March of 1938, promoting the Franklin Rural Electric Co-Operative in Hampton. In the early 1930s, only ten percent of the farms in this country used electricity for home and farm purposes. In May of 1935, President Franklin Roosevelt signed the Rural Electrification Act, to provide federal money to help farmers build distribution lines. The next March, the local newspaper in Hampton ran a story asking if there was enough interest in electrifying the rural areas of north central Iowa. In February 1937, the Federated Rural Electric Association was created, covering the counties of Franklin, Hardin, Wright, Butler, Grundy and Hancock. Days after, the new group asked for a $222,000 loan from the national REA fund so local farmers could build their own generating plant. When that was approved, things began to move quickly. A plant was built, and the first meter was set at the E. H. Messerschmidt farm in West Fork township on March 21st, 1938. A week later, as locals remembered it, the juice started to flow. Over the next decade, a total of four diesel engines were installed in the Hampton plant, which is now owned by the county historical society. It's now on the National Register of Historic Places, and with good reason. The Franklin Rural Electric Co-Operative became the first coop in the nation to put farmer-owned generated electricity out on farmer-owned lines, when electricity started to run through those lines on this date in 1938. According to the 1940 census, the O'Brien county town of Hartley in northwest Iowa was definitely booming. The population jumped by 18 percent from the previous decade, up to more than 15-hundred people. That included families with young children. So when the U.S. entered World War II in December of 1941, it was an anxious time. To help preserve some sense of things being normal, the citizens of Hartley, just like others across the country, supported their troops and tried to carry on with everyday life. There had been talk for some time about starting a library in town. So despite the war, they did just that...and the Hartley Public Library was opened on Friday, March 27, 1942. Given the wartime climate, it was appropriate to house the new library in the upstairs room of the local Legion Hall. The population of Hartley then was 15-hundred...it's been fairly stable ever since, now just under 17-hundred. As for the library, it wasn't long before it outgrew that upstairs room in the Legion Hall. In November 1943, it moved to a first floor room in that same Legion Hall, and four years later, the library rented the old post office building for more space. That worked for 20 years until in 1963, the city purchased the former Cove Building, and with the help of local school children, the collection of books was moved there. A new addition to the facility opened in 2001. But Hartley's first public library opened in the middle of war in the local Legion Hall, on this date in 1942. More than 76 thousand Iowa men served in the Union army during the U.S. Civil War. No other state had a higher percentage of its male population between the ages of 15 and 40 serve in the military during the war. And no family gave more than the Littleton family of Louisa County. James and Martha Littleton arrived there in 1840, six years before Iowa became a state. At the time, they had five children. Five more were born after that. As the Civil War began, there were 10 Littleton children, six boys and four girls, under the age of 30. One by one, the Littleton men enlisted. Their parents had both died, and while the brothers were fighting in the war, their four sisters were left on the 200 acre family farm near Toolesboro. The oldest, George, enlisted on March 26, 1862. Two of his brothers had already done so. The other three signed up together a few months later, so by summer's end, all six were in the Union Army. And before long, all six would die. Kendall died in the battle at Prairie Grove, Arkansas before 1862 ended. John was wounded in that fight, and died in a hospital of his injuries. Noah survived that battle, but drowned a few months later while returning in a boat with supplies. William experienced several battles, but died of disease in a military hospital. Thomas was in 10 major battle campaigns, including the Battle of Vicksburg, and was captured by Confederate forces. He died while in prison a year before the war's end. As for George, he was the only Littleton brother to make it back home. He too was captured, but later released. George was discharged after only 7 months of service because of disease. He returned home but died soon after. Three of every five Union soldiers died from disease. That included the oldest of Iowa's six Littleton brothers...all of whom died due to the Civil War...George Littleton enlisted to serve, on this date in 1862. It wasn't all that long ago that people marveled at being able to buy video tapes of their favorite movies to watch any time they wanted at home. Then technology advanced, and DVDs of those movies became all the rage. Iowa worked aggressively during the 1990s to bring Hollywood filmmakers to Iowa to shoot their movies. One of those was the movie "Twister", which was filmed in part around Boone, Ames, and Eldora. The movie starred Helen Hunt and Bill Paxton as storm chasers researching tornadoes. It had a budget of $92 million, and grossed $10 billion at the box office when it was released in 1996. One of the scenes called for a tornado to demolish an old Iowa farmhouse. Producers selected a century-old Hardin County home that was once the grandest home in the county. It had been boarded up for the previous 30 years and seemed like the perfect spot. But people in the area got upset at the thought of the old Follett home being destroyed in this way. So they got the owner of the property to change his mind, and the moviemakers changed the script, demolishing only the barns and outbuildings for the movie...even adding a line to the script, with an actor saying "Look, it didn't take the house." The "Twister House", as it became known, became a bed and breakfast for about 10 years after the movie. You can see it now if you have a DVD of the movie...and if that DVD was one of the original ones released in 1997, it may actually be a collector's item. You see, the movie "Twister", filmed in Iowa, was the very first feature film ever to be released on DVD. The "Twister" DVD was released for sale on this date in 1997. James Tiberius Kirk will be born on this date, March 22nd, in the future year 2228 in Riverside, Iowa. You know Captain James T. Kirk as the commander of the Starship Enterprise in the Star Trek television series and movie. The character was created by Gene Roddenberry, who wrote in 1968 during the TV show's run that Kirk would be born in a small town in Iowa. Back in March of 1985, Trekkie and Riverside, Iowa city councilman Steve Miller thought since the specific town in Iowa where Kirk would be born was not stated, then why not Riverside? At the very next city council meeting, he proposed that Riverside declare itself to be the future birthplace of James T. Kirk. The motion passed unanimously. The town changed its slogan from "Where the best begins" to "Where the Trek begins", and changed its annual summer festival from River Fest to Trek Fest. The town wanted to create a bust of Kirk to display, but Paramount Pictures wanted $40,000 for a license fee. So instead, the town simply set a plaque where they believe Kirk will be born, and built a replica of the Enterprise, called the USS Riverside and not built exactly the same, to avoid violating trademark law. It's one thing to stake a claim; it's another to have it adopted by the creators of the Star Trek movie. That's what happened in 2009, when Riverside, Iowa was identified in that year's Star Trek movie as Kirk's hometown. Why March 22nd? Perhaps the citizens of Riverside are good at predicting the future. Or perhaps because it's also the birth date of William Shatner, who brought Kirk to life in the TV series. James T. Kirk will begin going boldly where no man has gone before, when he will be born in Riverside, Iowa, on this date, in 2228. March 20th, 1910, was a Sunday...Palm Sunday, in fact. A bridge near Shellsburg collapsed, and a freight train there derailed, killing the engineer. That meant trains had to be rerouted, including two Rock Island passenger trains, both bound for Minneapolis. They were instead sent to Marshalltown, then to Waterloo, eventually to make it to Minnesota. Each train had arrived in Marshalltown by the early morning hours of Monday, March 21st. Rail officials decided instead of running two trains, they would join the two together for the trip to Waterloo and back the locomotives up the whole way. That would prove to be a fatal error. The combined train left Marshalltown just after 7:30 a.m. It passed through Green Mountain a little after 8. Four miles northeast of Green Mountain, the train--which some think was traveling well above prescribed safe speeds--derailed. At least 80 passengers and crew were on the train. The so-called pilot of the effort, John White, was badly burned, but he and a passenger managed to get to a farmhouse to get help and notify the railroad agent in Gladbrook. A group of Marshalltown physicians soon arrived by car. By 10:30, a bit more than two hours after the derailment, a relief train arrived from Marshalltown to take away the injured, quickly overwhelming the medical facilities in town. A total of 55 people were killed that Monday morning by the Green Mountain Train Wreck, including John White, who later died of his burns. That number does not include the county coroner, who was thrown from a speeding wagon as it rounded the corner of 12th Street and Main and died a month later himself. Today, there's a monument on Zeller Avenue, marking the greatest railroad tragedy in Iowa history, which happened near Green Mountain, on this date in 1910. "The Bulldogs in the Final Four"
The scene was the men's college basketball semifinal, at Freedom Hall in Louisville, on March 20, 1969. UCLA was the class of the college basketball world, with a legendary coach, the Wizard of Westwood, John Wooden, and a 7-foot senior center named Lew Alcindor. Standing in the way of UCLA reaching the championship game was an upstart team from the Missouri Valley Conference...the Drake Bulldogs, led by Coach Maury John. The names of those Bulldogs are still familiar to fans...Willie McCarter, Dolph Pulliam, Rick Wanamaker, Willie Wise. UCLA only led by two at halftime, thanks to a unique strategy Coach John employed. Most teams thought keeping the score low was the secret to upending the Bruins, but Maury John told his team to keep shooting. In fact, Drake put up 83 shots in the game, 33 more than UCLA. With less than a minute to play, the Bulldogs only trailed by one. But two late free throws gave UCLA the 85-82 win over Drake. Two days later, Drake crushed North Carolina and coach Dean Smith in the consolation game, 104-84. UCLA went on to down Purdue in the championship by 20 points as well, giving Alcindor his third college championship. In an odd show of sportsmanship, late in the championship, the UCLA fans started pointing and chanting at the Drake section..."you're number two"...as a show of respect for the closeness of that Final Four semifinal game. Drake's 1969 Final Four team has remained close over the years, even though now the players are of retirement age. Dolph Pulliam credits Maury John for bringing him, McCarter, and other African-Americans to central Iowa in the racially charged 1960s, and creating a family-like bond that has lasted a lifetime. And as today's players dream of their Road to the Final Four, we remember the Drake Bulldogs, who narrowly lost in the NCAA national semifinal to the greatest college basketball power of all time, UCLA...on this date in 1969…50 years ago today. "A Reporter Versus A President"
A group of broadcast journalists gathered in Houston, Texas for the 1974 convention of the National Association of Broadcasters. One of the events at the convention was an appearance by President Richard Nixon, and a select group of journalists was picked to ask the president a question at a news conference. The 17th question was asked by legendary Iowa broadcaster Grant Price, then working as head of the news operation for the Black Hawk Broadcasting Company. The question--and the answer--made headlines. "In view of some of the USDA miscalculations of the past...what assurance do the farmers have that their super output will not lead to a disastrous break in farm prices as, in fact, has already occurred in the beef feeding industry?” Price asked. "Well first, let me say that despite what is called a disastrous break in farm prices, the farmers have never had it so good,” Nixon responded. “And second, we want them to have it good, because the farmer isn't going to produce unless he gets a good price. And I know Iowa well because, as you know, I was stationed there during the war." That response didn't sit very well in Iowa's heartland. The "farmers never had it so good" quote was front page news back in Iowa and other Midwestern states. It did not get as much national attention as it might have, because of the question and answer just before that, as Nixon and CBS reporter Dan Rather got into a verbal exchange tied to the Watergate scandal. Oh, and who was next to ask a question, after Price? NBC's Tom Brokaw, who got his start in TV news in Iowa. But it was the question asked by Waterloo, Iowa's Grant Price that led President Nixon to claim "farmers never had it so good", on this date in 1974…45 years ago today. "A Founder of the Tractor"
In 1892, two students at the University of Wisconsin-Madison with similar names met...one was Charles Hart, the other was Charles Parr. They had other interests in common, too. They worked on a special honors thesis together, and from that plan built three working internal combustion engines on the campus there. After graduation in 1897, Hart and Parr secured $3,000 in capital and founded their own business, the Hart-Parr Gasoline Engine Company. But they needed more money in order to expand the business and explore a new project. Near the end of 1899, Hart visited his parents in Charles City and mentioned his financial dilemma. Hart's father said there were people with money in that area who might be interested. Local attorney Charles Ellis was one of those; he invested $50,000 in the Hart-Parr project. As a result, the two men moved their business to Charles City in 1901, and the next year, debuted Hart-Parr Tractor number 1. A salesman ran demonstrations at county fairs, and slowly the new machine gained favor. Some of the first tractors delivered were demonstrating usefulness far surpassing that of steam engines. They used the phrase "traction engine" to define their creation, but in 1906, Hart-Parr's sales manager, W.H. Williams, decided the phrase was too vague and too long to use in news releases, so he invented the word "tractor", combining traction and power. As a result, and because the Charles City plant was the first to be continuously and exclusively used for tractor production, Hart and Parr were given the title as founders of the tractor industry. In 1929, the company merged with a number of other similar manufacturers, all using the name Oliver...and while the Hart-Parr name disappeared from machines, Charles Parr stayed with the company he founded until his death in 1941. Today, we remember one of the founders of the tractor, Charles Parr, for he was born on this date in 1868. On March 15th, 1963, Victor Harry Feguer was executed at the Iowa State Penitentiary in Fort Madison. He was the last prisoner executed in Iowa, and the last federal inmate executed in the United States until Oklahoma City bomber Timothy McVeigh met his fate. Feguer was a bit of a drifter, a Michigan native. He came to Dubuque in the summer of 1960. Almost immediately, he began carrying out the murder that led to his own death. He began calling doctors, going alphabetically in the phone book, claiming a woman needed medical attention. One, Dr. Edward Bartels, responded. Feguer kidnapped him, crossed into Illinois, and killed him. Officials believed it was to get drugs the doctor might have. Feguer was caught in Alabama, trying to sell the doctor's car. Because he crossed state lines, his crime came under the federal courts. He was convicted and sentenced to hang. Gov. Harold Hughes, a death penalty opponent, even contacted President John Kennedy, seeking clemency for Feguer; Kennedy thought the crime was so brutal, he denied the request. For his last meal, Feguer requested a single olive with the pit still in it. He said he hoped that an olive tree--a symbol of peace--would sprout from his grave. Shortly before sunrise, wearing a new suit provided by the prison, Victor Feguer was hanged. He was buried in an unmarked grave in Fort Madison, wearing a second new suit provided for his burial--the olive stone from his last meal tucked in a pocket. Iowa abolished the death penalty for state crimes two years later, making Victor Feguer the last prisoner to be executed within the borders of the state, on this date in 1963. When David Henderson was born on March 14th, 1840 in Scotland, no one probably imagined he'd play a large role in Iowa history. When he was six years of age, David and his parents came to America, first to Illinois and then three years later, to a farm near Clermont in Fayette County. He served in the Union Army during the Civil War and was severely wounded twice, including an injury that led to progressive amputations of his leg. After the war, he practiced law in Dubuque, and then began a political career, first being elected to the U.S. House from Iowa's Third Congressional District in 1882. An aggressive debater, he quickly moved up the Republican leadership ladder in the House. He was known for combining mainstream Republican causes with those important to Midwest farmers. He was first elected as Speaker of the House in 1899 and was urged to run for president...but according to the Constitution, since he was not born in this country, he could not do so. After four years as Speaker and ten years total in Congress, he abruptly dropped his re-election effort in 1902. He indicated that his views on tariffs differed from too many in his own party, and his lingering war injuries also were a factor in his decision. After Congress, Henderson practiced law in New York until ill health forced him to retire to Southern California. He died in Dubuque on February 25th, 1906, at age 65 and is buried there. As with all past Speakers of the House, if you tour the U.S. Capitol, you'll find David Henderson's portrait hanging in the Speaker's Room. He was the last Civil War veteran in Congress…the first Speaker from west of the Mississippi River...and so far, the only Iowan to serve as Speaker of the House...David B. Henderson, born on this date in 1840. On March 13, 1934, a dark blue Buick sedan pulled up outside the First National Bank in Mason City. There were seven people in the sedan, including John Dillinger, Baby Face Nelson, and five others. Two remained in the car, while the others either entered the bank or stood watch outside. The gang entered the bank and started shooting their guns into the ceiling and walls. Bank guard Tom Walters watched from an elevated bulletproof observation booth, and fired a tear gas cartridge, hitting one of the robbers in the back. Bullets then shattered the glass of the observation booth, but Walters was not hit. By sheer coincidence, earlier in the day, a newsreel camera operator started shooting film of the bank, which led to a crowd gathering to watch. They were still there as the robbery unfolded, and some people in the crowd and in the neighboring Nichols and Green shoe store were used by the robbers as shields from police. Waving their guns, the robbers then ordered people on the street to cling to the getaway car, either by holding on to the sides or standing on the rear bumper. Numbers vary, but it's generally thought two dozen people were taken hostage in that way. The robbers left the bank with $52,000 and made their escape in the Buick, with Mason City residents hanging on as human shields. The hostages were let off the car over the course of the next hour, individually and in small groups. The car was found that night in a quarry four miles south of Mason City. It was the second success for the gang in a week, as they robbed a bank in Sioux Falls seven days earlier. Dillinger himself would not celebrate many more escapes. Only four months later, he was killed by Chicago police as he left a movie theater there. But it was a clean getaway for John Dillinger, Baby Face Nelson, and the rest when they robbed a bank in Mason City in broad daylight on this date in 1934. Prior to 1907, Iowa's hospitals set their own educational standards as a condition of employment. There was nothing to prohibit a person from claiming to be a nurse...no uniform requirements regarding training, no licenses, no competency examinations. On March 12, 1907, the Iowa Legislature took the first step toward making sure those who provided nursing care to Iowans were qualified. That came with passage of the Nurse Practice Act, which required education and licensure by examination. That law required applicants to be at least 23 years of age, and of "good moral character". That last requirement remained part of Iowa law until 1964, and was often proven by references from clergy and teachers. Licenses could be revoked for fraud, immoral or unprofessional conduct, or violation of Board of Health rules. And those who practiced nursing without a license were guilty of a misdemeanor. But there was no definition of what nursing was. That did not come until 1938, when language referencing licensing and actual duties of the profession was included in Iowa law. The first licensing exam had 50 essay questions. There were 10 questions on "diseases of men", but those were taken by men only. A total of 695 nurses were licensed right away without a test, based on their past experience or education. Seven people took that first exam in 1908...all passed. Nearly a century later, in 2000, legislation was passed making Iowa the 9th state to join the multi-state licensure compact agreement, to allow nurses licensed in one state to practice in any other state that was part of the compact. But the regulation of nursing as a profession began when the first Nurse Practice Act was passed, on this date in 1907. "From Peking, to the Medal of Honor"
On March 11, 1902, the first-year plebes were assembled at the West Point military academy. Their commander in chief, President Theodore Roosevelt, was there. He walked over to Iowa native Calvin Titus, pinned a Medal of Honor on his coat, and said, “Now, don’t let this give you the big head.” The action even impressed one of the second year classmen, named Douglas MacArthur. Calvin Titus was born in Vinton. After his mother died, he left the state at age 11, and accompanied his uncle, who was a travelling preacher, around the country. In 1898, the 19-year-old Calvin heard that the battleship Maine had sank, and that prompted him to enlist. By the summer of 1900, Titus was an Army bugler, marching toward Peking in scorching heat as part of an international military rescue operation. Their mission was to free a group of foreigners trapped there. The Boxer Rebellion was escalating, and the 14th Infantry from the Philippines was advancing toward Peking. They were stopped by a 30 foot wall surrounding a compound where the foreigners and a group of Chinese Christians were being isolated. The troop commander looked up at the wall and wondered aloud if it was possible to climb it. Calvin Titus spoke up, saying, “I’ll try it, Sir.” The men of his company watched as Titus made his way up the wall, placing his feet in the cavities and clinging with his fingers to the projecting bricks. Higher and higher he climbed, until he reached the top. But would danger, in the form of Chinese troops, be waiting for him there? Calvin Titus carefully peered over the top of the wall. The Chinese soldiers had left the scene, and Titus urged his fellow soldiers to follow suit, climbing the wall to liberate those inside the compound. The Allied troops lift the siege, the Boxer Rebellion is stopped, and Titus is a hero. His hometown of Vinton made him the guest of honor at its 1901 Independence Day celebration. His phrase, “I’ll try, Sir,” became the motto of the 14th Infantry. In honor of his bravery, President William McKinley granted Titus a West Point commission. He later became a lieutenant colonel, and ran the Coe College ROTC program until retiring around 1930. But the president personally awarded Iowa’s Calvin Titus the Medal of Honor, on this date in 1902. The winter of 1856 and 1857 was especially harsh. Supplies were hard to come by, and tensions were high between Iowa frontier settlers and some Native Americans in northwest Iowa. The federal government had set up a reservation along the Iowa/Minnesota border, pursuant to terms of a treaty. But promised improvements were not made on time, supplies were shipped too late, and what was shipped was not adequate for survival. On the morning of March 8, 1857, one Native American pushed his way into a cabin occupied by the Rowland Gardner family, a log structure on the south shore of West Okoboji. He demanded food, which was provided. Then another 14 Sioux under the leadership of the renegade chief Inkpaduta entered the cabin. They ate and left. But they returned that afternoon, and what became known as the Spirit Lake Massacre began. Between 35 and 40 settlers were killed over a five-day period, and four young women were taken captive. One of the four was Abbie Gardner, a 13-year-old whose family was murdered in that cabin after providing food to the intruders. She was ransomed a few months later to a federal agent who paid two horses, 12 blankets, 20 pounds of tobacco, cloth, calico and ribbon, and two kegs of powder. Some 30 years after the killing, Abbie Gardner published a memoir, which became popular as one of the last captivity narratives of European Americans being held by Native Americans. In 1891, she bought the cabin where the events occurred and turned it into a tourist site, where she sold her book and other items for 30 years. The state of Iowa now maintains the Abbie Gardner Sharp home site and park. The renegade chief Inkpaduta was never found, but the killing spree he organized led to strained relations for decades, and retaliation against innocent individuals. The last Native American attack on settlers in Iowa began on this date in 1857. Some 30 years after it was first discussed, the first transcontinental railroad in this country was built in the 1860s, connecting a well developed railway network in the eastern United States with the newly settled areas of the west. Building the rail line was an important goal of President Abraham Lincoln. It was motivated in part to tie California to the Union during the Civil War. But where to lay the tracks for the new line? There were several options, and the choice was an important one, because towns that had a rail line running through them quickly grew into major cities. Some advocated a southern route, avoiding the Rocky Mountains by going through Texas to Los Angeles. A northern route, along the path taken earlier in the century by Lewis and Clark, was deemed impractical due to winter snow. Congress opted for a central route in 1862, and the Central Pacific was hired to lay 690 miles of track starting in Sacramento, California. The Union Pacific was to start at the eastern end of the line, and the 1,087 miles of track they built connected with the Central Pacific track, with a golden spike driven into the rail to denote the connection, at Promontory Summit, Utah. On March 7, 1864, President Lincoln signed an order that directed the eastern part of the line be located in Council Bluffs, Iowa, even though at the time, the closest rail line was 150 miles east of there. He had visited the location back in 1859 before he had even run for president, working as a private attorney for Thomas Durant. Durant was a central figure in building the transcontinental line. That past working relationship and Lincoln's personal familiarity with the location is why Council Bluffs was selected as the location of the transfer depot, where up to seven railroads could transfer mail and other goods to west bound trains. It was considered by some to be the greatest technological feat of that century, the building of the transcontinental railroad. And its easternmost point was Council Bluffs, thanks to a presidential order issued on this date in 1864. The headline in the Evening Times-Republican in Marshalltown on March 6, 1911, likely gave readers an idea of how the paper viewed the topic. It read "Suffragists Invade Iowa State House". The story says that women suffragists from all parts of the state appeared before a state Senate committee discussing constitutional amendments that day. Leaders of the national suffrage movement also attended, urging support for what was known as the Allen resolution, which would have put the suffrage question to a direct vote of the people. And it was not just a women's issue, as one of those speaking that day was the head of a group called the Men's League for Women's Suffrage. The struggle had been going on for some time. The first women's suffrage association in the state was formed in Dubuque in 1869, and the first state convention on the topic was held the next year, in Mt. Pleasant. To give women the vote, the Iowa Constitution would have to be changed. It takes a positive vote of two sessions of the legislature, and back then, they only met every two years. The effort passed in 1870, but failed the next time the legislature met, in 1872. It went on like that for a while. In 1894, the legislature granted partial suffrage to women, allowing them to vote on public issues, but not elections for public officials. Momentum was gathering, and 1910 was a year when the movement was gaining a lot of support, which is why the group was testifying before a Senate committee on this particular date in 1911. It took until 1916 before the Iowa legislature approved a constitutional amendment giving women the right to vote, but it had to be approved by voters. It failed. Finally, the U.S. Constitution was amended so women could vote throughout the U.S. in 1920, more than 60 years after the issue had come up in Iowa. But only due to the perseverance of dedicated Iowans, like those who invaded the state capitol in Des Moines, on this date in 1911. It was the depth of the Great Depression...not exactly a time to open a new retail business. But Sears, Roebuck and Company was different, and on March 5, 1936, Mason City residents saw a Sears store open in their city. The famous Sears catalog was well known, but at that time, Sears stores had only been around for a decade. The two-story store was located at 23 to 25 E. State Street in downtown Mason City, welcoming residents with a wide range of affordable merchandise. That year, the company's net sales totaled nearly a half billion dollars. The Mason City store was one of 440 in the U.S.
Before long, the downtown store was too small, and as part of the emerging trend toward a new concept, the shopping center, Sears moved to the new South Federal Avenue shopping center in 1959. The store was a major tenant at the shopping center, which was located on ground formerly occupied by the North Iowa Fair. The new single story, medium size store was one of 16 Sears stores that relocated to larger quarters that year alone. The new 80,000-foot store featured a large furniture and appliance showroom, of course, but also a candy counter, employee cafeteria, and an 8-car service station. The Mason City store began the 1960s as the second largest Sears store in Iowa, employing 120 people. And as the 1990s began, Sears expanded its store in the Southport Shopping Center by taking space formerly used by two neighboring stores. Like many famed 20th century retailers, Sears has had to reposition itself with increased competition, including from online stores. But north Iowans were on the forefront of something new when the original Sears, Roebuck and Company store in Mason City opened on this date in 1936. "From Iowa Boy to President"
​With a simple, "I Will", Herbert Clark Hoover took the oath of office as the 31st president from Supreme Court Chief Justice William Howard Taft, himself a former president. For most, becoming president would be the highlight of a career resume. But not for Herbert Hoover. Herbert Hoover was born in West Branch, Iowa on August 10, 1874. By the time he was 9, young Bertie was an orphan, and soon left Iowa to live with relatives in Oregon. He was the first student at Stanford University and became a mining engineer. When World War I began, Hoover helped organize the return of 120,000 Americans from Europe. By war's end, Hoover was recognized around the world for spearheading global efforts to ward off famine caused by the devastation of war. A fiscal conservative, one of Hoover's favorite sayings was, "Blessed are the young, for they shall inherit the national debt." Both Democrats and Republicans wanted him to run for president as their respective party's nominee in 1920. Instead, he became Secretary of Commerce, and by 1928, having declared himself a Republican, he became his party's nominee. He was the overwhelming choice of his countrymen to lead them, winning 58 percent of the popular vote in the 1928 election. At the time of his swearing in, Hoover could hardly have known that in only six months, the stock market would crash and the U.S. would plunge into the Great Depression. He took the blame, and was defeated in his re-election bid by Franklin D. Roosevelt in 1932. But Hoover's talents were used by two other presidents: Harry Truman sought his help in feeding the hungry overseas after World War II, and both Truman and Dwight Eisenhower called upon Hoover to lead separate government reorganization efforts. But that was all in the future, a future that was filled with hope and optimism, as the only native Iowan to become president took the oath of office on this date in 1929…90 years ago today. On February 21st, 1950, local television came to central Iowa, as WOI-TV began broadcasting from the campus of Iowa State University in Ames, the first station to serve the region. Even after other stations signed on, the station still claimed a number of firsts, including being the first station in the Des Moines market to produce a live local newscast, and in 1981, the first local station in the country to originate a live broadcast of an NCAA athletic event via satellite. The station maintained a close relationship with ISU and was a laboratory for students in journalism and meteorology. In 1987, in order to allow WOI-TV to operate independently from the university, a separate corporation was established to run Channel 5. The profits from the station and rent paid for using university facilities often added up to a half-million dollars a year of revenue for ISU. But on June 17, 1992, the state Board of Regents voted to sell the station for $14 million, which was to be placed in trust and the revenue used to support Iowa State. Alumni, faculty, students and members of the public objected, since at that time WOI was one of only three commercial stations in the country to be owned by a university. A lawsuit ensued, challenging the Regents' authority to sell off university assets. However, the sale went through and the new owners took over on March 1st, 1994. Major changes were immediately evident, including the abrupt cancellation of the longest-running, locally-produced children's program in U.S. television history, The Magic Window. The station was sold again in September of 2013, this time as part of a three-station cluster that brought $88 million. But the check for $14 million from that first sale had cleared, and the keys to WOI-TV were given to private owners, on this date in 1994…25 years ago today.